French statesman, the finance minister of Louis XVI, was born at Geneva in Switzerland. His father was a native of Cüstrin in Pomerania, and had, after the publication of some works on international law, been elected as professor of public law at Geneva, of which he became a citizen. Jacques Necker had been sent to Paris in 1747 to become a clerk in the bank of a friend of his father, M. Vernet. He soon afterwards established, with another Genevese, the famous bank of Thellusson & Necker. Thellusson superintended the bank in London (his grandson was made a peer as Lord Rendlesham), while Necker was managing partner in Paris. Both partners became very rich by loans to the treasury and speculations in grain. In 1763 Necker fell in love with Madame de Verménou, the widow of a French officer. But while on a visit to Geneva, Madame de Verménou met Suzanne Curchod, the daughter of a pastor near Lausanne, to whom Gibbon had been engaged, and brought her back as her companion to Paris in 1764. There Necker, transferring his love from the widow to the poor Swiss girl, married Suzanne before the end of the year. She encouraged her husband to try and make himself a public position. He accordingly became a syndic or director of the French East India Company, and, after showing his financial ability in its management, defended it in an able memoir against the attacks of A. Morellet in 1769. Meanwhile he had made interest with the French government by lending it money, and was appointed resident at Paris by the republic of Geneva. Madame Necker entertained the chief leaders of the political, financial and literary worlds of Paris, and her Fridays became as greatly frequented as the Mondays of Madame Geoffrin, or the Tuesdays of Madame Helvetius. 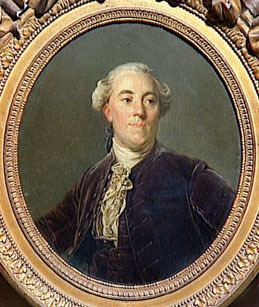 In 1773 Necker won the prize of the Académie Française for an éloge on Colbert, and in 1775 published his Essai sur la législation et le commerce des grains, in which he attacked the free trade policy of Turgot. His wife now believed he could get into office as a great financier, and made him give up his share in the bank, which he transferred to his brother Louis. In October 1776 Necker was made finance minister of France, though with the title only of director of the treasury, which, however, he changed in 1777 for that of director-general of the finances. He did great good in regulating the finances by attempting to divide the taille or poll tax more equally, by abolishing the "vingtième d'industrie", and establishing monts de piété (establishments for loaning money on security). But his greatest financial measures were his attempt to fund the French debt and his establishment of annuities under the guarantee of the state. The operation of funding was too difficult to be suddenly accomplished, and Necker rather pointed out the right line to be followed than completed the operation. In all this be treated French finance rather as a banker than as a profound political economist, and thus fell far short of Turgot, who was the very greatest economist of his day. Politically he did not do much to stave off the coming Revolution, and his establishment of provincial assemblies was only a timid application of Turgot's great scheme for the administrative reorganization of France. In 1781 he published his famous Compte rendu, in which he drew the balance sheet of France, and was dismissed from his office. Yet his dismissal was not really due to his book, but to the influence of Marie Antoinette, whose schemes for benefiting the duc de Guines he had thwarted. In retirement he occupied himself with literature, and with his only child, his daughter, who in 1786 married the ambassador of Sweden and became Madame de Staël. But neither Necker nor his wife cared to remain out of office, and in 1787 Necker was banished by "lettre de cachet" 40 leagues from Paris for attacking Calonne. In 1788 the country, which had at the bidding of the literary guests of Madame Necker come to believe that Necker was the only minister who could "stop the deficit", as they said, demanded Necker's recall, and in September 1788 he became once more director-general of the finances. Throughout the momentous months which followed the biography of Necker is part of the history of the French Revolution. Necker put a stop to the rebellion in Dauphiné by legalizing its assembly, and then set to work to arrange for the summons of the states general. Throughout the early months of 1789 he was regarded as the savior of France, but his conduct at the meeting of the states general showed that he regarded it merely as an assembly which should grant money, not organize reforms. But as he had advised the calling of the states general and the double representation of the third estate, and then permitted the orders to deliberate and vote in common, he was regarded as the cause of the Revolution by the court, and on July 11 was ordered to leave France at once. Necker's dismissal brought about the taking of the Bastille, which induced the king to recall him. He was received with joy in every city he traversed, but at Paris he again proved to be no statesman. Believing that he could save France alone, he refused to act with Mirabeau or Lafayette. He caused the king's acceptance of the suspensive veto, by which he sacrificed his chief prerogative in September, and destroyed all chance of a strong executive by contriving the decree of November 7, by which the ministry might not be chosen from the assembly. Financially he proved equally incapable for a time of crisis, and could not understand the need of such extreme measures as the establishment of assignats in order to keep the country quiet. His popularity vanished when his only idea was to ask the assembly for new loans, and in September 1790 he resigned his office, unregretted by a single Frenchman. Not without difficulty he reached Coppet, near Geneva, an estate he had bought in 1784. Here he occupied himself with literature, but Madame Necker pined for her Paris salon and died in 1794. He continued to live on at Coppet, under the care of his daughter, Madame de Staël, and his niece, Madame Necker de Saussure, but his time was past, and his books had no political influence. A momentary excitement was caused by the advance of the French armies in 1798, when he burned most of his political papers. He died at Coppet in April 1804.